"Jason Sweet with his sculpture"
Image of the sculpture Architectural and Environmental Symposium on the campus of the University of Northern Iowa in Cedar Falls, Iowa. The sculpture by Jason Sweet, a UNI alumnus from the Dept. 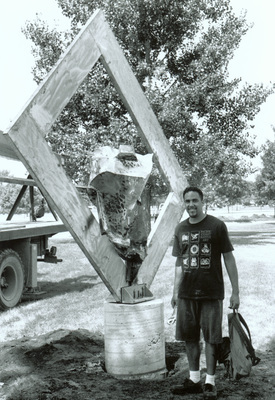 of Art, was installed at the west entrance of the Industrial Technology Center in 1994 and is an Iowa Art in State Buildings Project commission. The medium is bronze. "Jason Sweet with his sculpture" (2019). Art on Campus Photographs. 105.